Cozy up and stay awhile at Pathfinder Cafe. When Sarah Neupert was a Washington State University student in her 20s, she sat in the back of her boyfriend's roommate's Nissan Pathfinder the morning after a long night out in Spokane. The two roommates talked about how they'd make great business partners and would someday open a bike shop together. Neupert rolled her eyes. Fast forward 25 years, and Neupert and that former boyfriend, Mark, are now married with kids. And that bike shop her husband and his roommate dreamed up one night is Wheel Sport on 29th Avenue and Grand Boulevard, opened in 2017. Neupert decided to create a cafe inside the shop as a tribute to friendships and dreams that all began inside an old Nissan Pathfinder. "I'm always along for the ride and I always have been with those two," Neupert says. "I never want to miss out because they're always doing something fun." Opening last December, the cafe features touches of the couples' story in every corner. Pathfinder's menu uses recipes Neupert crafted during 18 years as a stay-at-home mom, and gives customers the option to go sweet or savory, at any hour. Pathfinder serves espresso drinks, chai lattes ($3.75), superfood lattes ($4.50), organic smoothies ($8+) and snacks like avocado toast ($6). There's also craft beer and cider in cans and bottles. "Avocado toast has probably existed in my life for 10 years," Neupert says. "So it's fun now being able to share all of these superfood lattes and all these things that were snacks for me with everybody else." There's a little something for everyone, including decadent cacao acai bowls ($12) blended with almond butter, maca powder and dates, and topped with granola, fruit, honey, cocoa nibs and goji berries that satisfy desires for a sweet but healthy start. Vegetarian crustless quiches ($5) with red peppers and artichokes are baked at Petit Chat Bakery in North Spokane, and served dressed up with Pathfinder's in-house sauces and greens. That's what Neupert wanted: choices. "I really wanted options for everyone, I wanted a place that would be eclectic," she says. "And it's interesting when you have all different types of food. It has brought together a lot of different types of people as well. And that was always my goal." Bright yellow accents and bike seats repurposed into coat hangers add to the eclectic aesthetic she envisioned. Neupert hopes customers stick around and enjoy their cup of coffee or snack; not only to fill the stools looking into her husband's bike shop, but as a continuation of their sustainability efforts. Pathfinder is currently in the process of applying for the Green Restaurant Association's certification, which acknowledges and measures efforts of restaurants to promote continued sustainability. 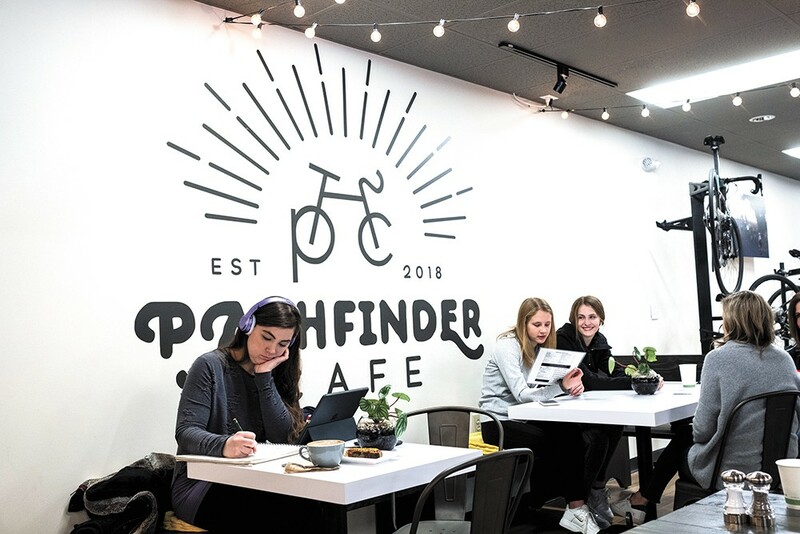 To incentivize that mission, when customers opt to dine-in, Pathfinder donates the 10 cents that each to-go container would have cost them to one of three Washington charities: SpokAnimal, Second Harvest and Evergreen Mountain Bike Association. Using wooden tokens, customers can choose which of the charities they'd like to donate to. "Part of that is [if] we own a bike shop, we need a planet to ride them on," Neupert says. The original print version of this article was headlined "Enjoying the Ride"